The Office and Professional Employees International Union, Local 32, AFL-CIO, is one of the largest and fastest growing unions in New Jersey, Pennsylvania, and Delaware. We represent 6,000 members in both the public sector and private sector employment. Our members work in a variety of technical, professional, clerical, white collar and blue collar professions. Please click on any one of the links on the left hand side of the page to learn more about OPEIU, Local 32, AFL-CIO. Kara Sheehan​ is a great organizer and leader of Texas YALL, Young Active Labor Leaders​, and an OPEIU Local 298 member. Check out her advice for young union leaders. Meet Kara Sheehan, a field organizer at the Texas AFL-CIO and member of the Office and Professional Employees International Union Local 298. Before joining the AFL-CIO, Sheehan worked with the Workers Defense Project and other local progressive groups in Austin, and worked at the Austin City Council. She was born into the labor movement, where both her parents and grandparents raised her with the values of solidarity and intersectional movements. On Wednesday, March 8, International Women's Day, women across the world are taking action to call attention to the contributions we make every day in our workplaces, homes and communities. We encourage OPEIU activists to show solidarity with working women around the world. Avoid shopping for one day (with exceptions for small and women- and minority-owned businesses). Wear RED in solidarity with A Day Without A Woman. Men who are allies of this movement and want to show solidarity can lean into caregiving and lend their support for equal pay and adequate paid family leave for women. New Hampshire will not become a so-called right-to-work state today, or next year. The Republican-led House voted to kill the union-targeted legislation Thursday afternoon, ending weeks of high-charged debate. While many expected a close vote, the final tally was much wider, at 200-177. The body then voted to ban consideration of right-to-work for the rest of the session, effectively killing it for the next two years. Despite its promises that ample warning would be given before additional school closings were planned, today the Archdiocese of New York contacted the Federation of Catholic Teachers to inform us that six schools are slated to close at the end of the 2016-2017 school year. This is in addition to the 55 schools that it has closed since 2011. Standing Up to Protect Our Progress! 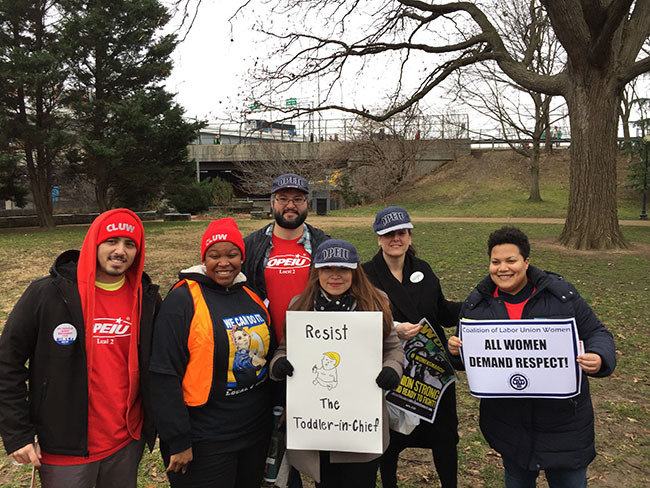 OPEIU members joined Women’s Marches across the nation on January 21, standing up to attacks against the hard-fought rights of women and working families. 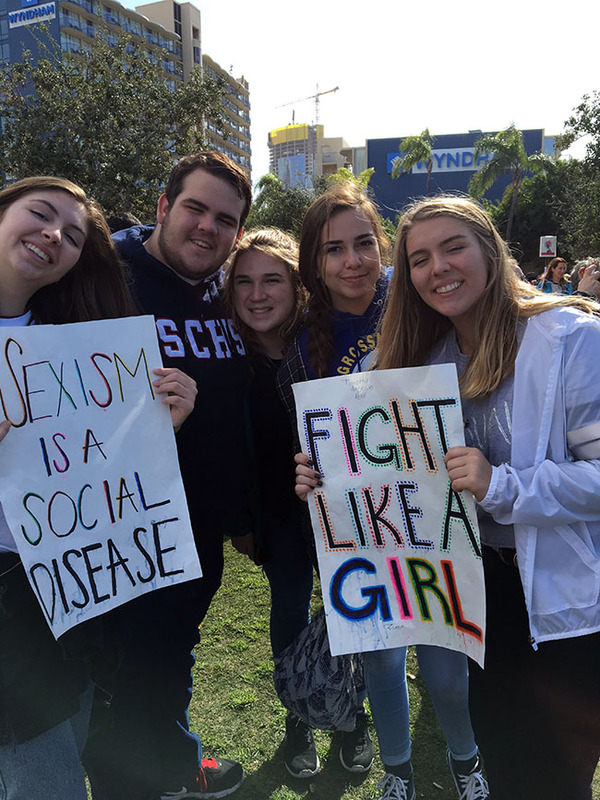 Pictured are Local 2 members at the march in Washington, D.C. (left), and Local 30 in San Diego, California (right). Share your march photos by emailing them to frontdesk@opeiu.org or posting to our Facebook or Twitter pages. OPEIU Nurses Council Chair Paige Yates, RN, shares her experience at the CAR:NG Conference at Rutgers, a gathering of labor and community organizations to share workplace best practices with nurses from across the United States. Yates is also president of OPEIU Local 22 in Little Rock, Arkansas, which represents nurses and other healthcare professionals. Since Donald Trump won the election, nearly 900 incidents of violence, hate speech and harassment have been reported. In light of these attacks, it's important that you know what your rights are and what you can do if you or someone you know is the target of one of these attacks in the workplace. Click on the links to learn more about your rights, what constitutes illegal activity and what you can do about it if you are targeted. Julie - On Staffing and Legislation from Nursebuzz on Vimeo. A group of servers who serenade patrons at Time Square’s Ellen Stardust have now, formed a union with–wait for it–the Wobblies (a nickname for the Industrial Workers of the World). After they unionized earlier this year as Stardust Family United, the owner, Ken Strum, said, Dream on–and wrecked the lives of over 30 staffers by firing them. Now they are picketing outside the venue weekly while singing old union and railroad songs. The waitstaff, consisting of aspiring Broadway actors, decided to organize when new policies prohibited them from easily switching shifts to attend auditions. New York, NY (October 4, 2016) – The Office and Professional Employees International Union (OPEIU), AFL-CIO, CLC, has named Cynthia Schu as its new organizing director. Schu joins the International after leading organizing efforts at OPEIU Local 8 in Washington State since 1991. During that time, she assisted OPEIU with a number of organizing campaigns. The state has issued directives through all state agencies that Governor Christie refuses to pay state workers for the days we were locked out during the state budget shutdown. As part of your Union membership, you are entitled to OPEIU's free towing service. This will assist you for flat tires, towing, and roadside assistance. All you need for help is to make the call. Click below to find out more about our member assistance program. "You can't exercise your rights...if you don't know your rights."